EZRA FURMAN is not one to stand still. He’s been rocking his way around the world for nearly 10 years and it seems as though his time has finally come. 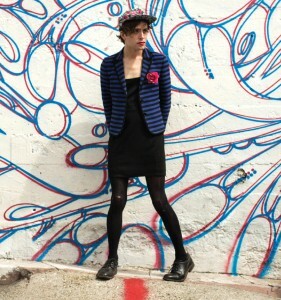 Hailing from Chicago, he started off fronting Ezra Furman and the Harpoons, then recorded solo material before deciding on his current outfit, Ezra Furman and the Boy-Friends. Ezra is now based in San Francisco, but it’s not just his geography that changes – some of his current press photos show him in female attire and he explains: “I am always changing the way I present my gender. “Also, my religious life is intensely up and down in terms of observance and personal convictions. I’ve always viewed the idea of truth itself as something wobbly, always slipping out of our grasp. A central idea is the fugitive or runaway in a hideout built in the midst of an unfriendly or alienated world. EZRA FURMAN plays at the Boileroom in Guildford on Wednesday (July 8) with support from Hannah Lou Clarke and Alake. Other upcoming Boileroom gigs include The Magic Gang (Thursday, July 9), The Smyths (July 11), Loom (July 17), Macka B & the Roots Ragga Band (July 18) and Piano Wire (July 23).